New designs are in the works. 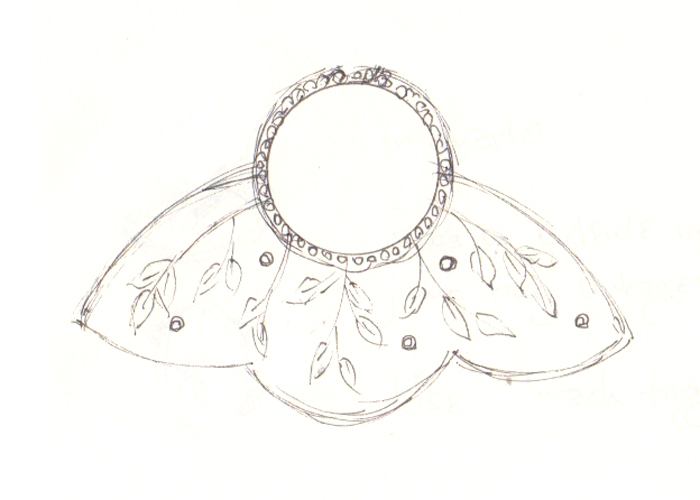 It's interesting that my approach to designing jewelry is a bit different than my approach to designing quilts. With quilts, I very much design on the fly, usually starting with a small central piece and then letting the piece get larger and larger by adding more around the edges, or working in a grid of smaller pieces. Perhaps because jewelry just can't be seven feet square, I don't 'grow' it in a similar way. Most of the time I actually draw designs in my sketchbook and then make a piece quite similar to the concept. Yes, things change as a I problem solve, but mostly I have a pretty good idea how the piece is going to come out. This new design is returning to my cache of enamels. I adored my workshop more than a year ago with Charity Hall, where I learned new enamel techniques that allowed me to layer color and design to build up tiny compositions very like my journal pages. I actually made a piece from fine silver clay to mount one of my favorite enamels from the class, but had some non-symmetrical shrinkage that caused the piece to come out of the kiln substantially not round. That reminded me why I usually make my bezels in metal clay first and then dap the copper to fit before I do the enameling. Yes, I could get better at planning for shrinkage for metal clay, but Argentium seems like the perfect fix. I'll build the setting for the enamel with sheet and wire, and attach it to the larger piece with a granulation border. I think the design reminds me of echinacea flowers, so I may have to make a new flower enamel to insert. But perhaps it's a perfect way to merge the flowers I've been playing with lately with my trademark birds.